Every Wednesday RoommateRachel and I host a dinner party. The guest list (8-10) is a mix of our friends, people we want to be our friends, and people we think should be friends with each other (also factored in is food preferences, schedule, frequency of invite/re-invite etc.). It's a different mix every week, and has been a great way to get to know new people here at school and bridge the Business-focus/IR-focus divide (RoommateRachel studies International Business). (shrimp and butternut squash) with tomatillo salsa in the middle. Usually I make dessert and Rachel handles the meal, but last night we switched things up. It is COLD here, so we decided on a semi-tropical/warm weather-ish theme. 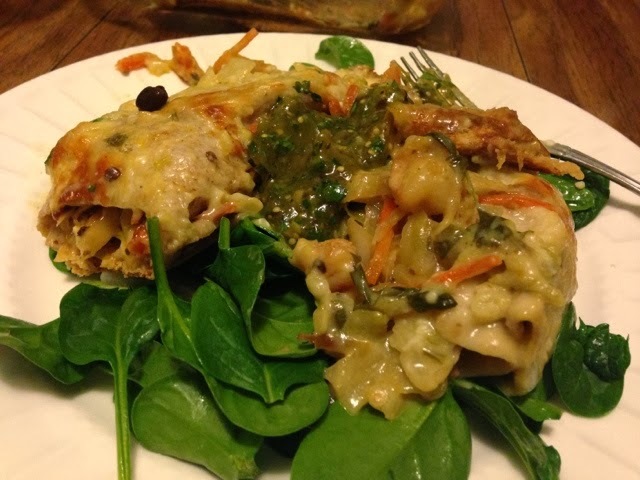 I made a delicious dinner my mama made for me over winter break: Shrimp Enchiladas with Roasted Poblano Sauce. To account for hungry grad student appetites, I doubled the recipe and made a shrimp version and a butternut squash and cheese version (oh hey vegetarians I got you covered!). These enchiladas are what I would call California food: heavy on the fresh vegetables, whole wheat tortillas, with a little bit of Mexico mixed in, and some spicy kick. I served them over a simple salad of spinach, black beans, and red onion with lime/olive oil dressing, plus chips and tomatillo salsa (which I cannot take credit for but it was goooood). So without further ado, the recipe is based on this one from Annie's Eats. You should make it -- you will love it. Total time: Approximately 1 hour...but if you factor in all the veggie chopping/shredding, give yourself an hour and a half. To roast peppers: Preheat oven to 475 degrees F. Place peppers in a medium baking dish. Bake, turning every 6-8 minutes until the skin is blistered over most of the surface, about 20-25 minutes. Transfer to a medium bowl, cover, and let sit 15 minutes. When cool enough to handle, peel away the skin and discard. Remove the stem (and the seeds and ribs too if you don't want it to be spicy). Coarsely chop the peppers and set aside. To make the sauce: Melt butter in a medium saucepan, then stir in the chopped poblanos. Mix in flour, cooking briefly just until golden, 1-2 minutes. Whisk in the broth, adding a little at a time, mixing well after each addition. Add garlic powder. Season with salt and pepper to taste. Let cook over medium heat, stirring frequently, until the mixture bubbles and thickens. Remove from heat and stir in the sour cream/yogurt and cilantro. To make filling: Heat 1 tbsp. olive oil in a large skillet over medium-high heat. Add onion, garlic, oregano, and cayenne; cook until onion is tender, about 5 minutes. Season with salt and pepper to taste. Stir in cabbage and carrots [and butternut squash]; cook, stirring occasionally, until veggies start to get tender (about 7-10 minutes). Stir in chopped raw shrimp; cook for about 2 minutes, stirring, until the shrimp start to get pink (don't worry about cooking them completely now because they'll finish in the oven). To assemble: Lightly grease a 9X13-inch baking dish. 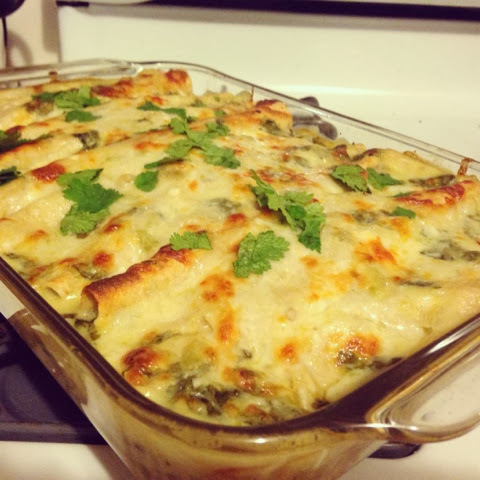 When pan is filled, pour the poblano sauce over the enchiladas. Bake until bubbling and slightly golden, 20-25 minutes. At the end, turn off the oven and turn on the broiler for 2-4 minutes (watch them) to get the tops nice and brown. Sprinkle with additional cilantro. Serve immediately. I know I say this every time I write now, but, hello! It's been too long! School kicked into gear hard, I dropped off the face of more than just the internet earth, and this silly little blog that used to be my favorite thing to do every morning fell by the wayside. I miss it! So here I am, back again. Let's pretend like I never left. Ok? Ok. This weekend I revisited another one of my favorite things from my past life (i.e. pre-school): baking epic birthday cakes! The only picture is blurry...sorry. Just pretend it's purposefully Artistic. Friday was looooonnnggg -- I had class starting at 7:30 am, and then a big presentation at 4:30pm. Ick. Needless to say, I got home feeling like I'd been to war. So I made a beeline for the kitchen, cranked up my favorite song, and made frosting. I'd made the Red Wine Chocolate Cake the night before, in a quick break between readings, and plastic-wrapped and froze the three gorgeous layers. Friday was creativity time: I had an idea for Raspberry Cream Cheese Frosting that involved straining the raspberries, because yum (also, straining = no seeds). And it worked! It worked SO WELL. Forgetting the day behind me and looking forward to the birthday party ahead, I danced around the kitchen licking the beaters and marveling in the fact that frosting can be sooooo good! Microwave the raspberries, then puree them in a blender. Pour the raspberry slush into a fine sieve, and push it through with a spatula to get all the raspberry and none of the seeds. In a large bowl, beat cream cheese, butter, vanilla, rum, raspberries, and cream until smooth. Add powdered sugar and beat until smooth. If it's too thick, add more cream; too thin, add more sugar. Like the out-of-practice blogger I am, I totally forgot to take pictures of this gorgeous masterpiece. But trust me on this, it was beautiful! And everyone agreed that the cake was delicious. And that perhaps baking cakes should be my post-grad school backup plan (you know, in case this whole International Relations thing doesn't work out.) 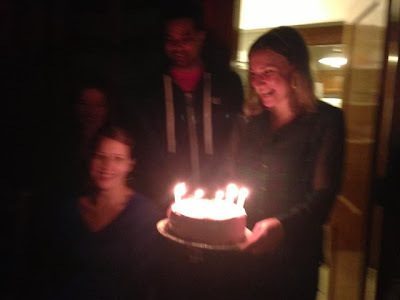 And the birthday girl (HAPPY BIRTHDAY KATIE!) said that I won at her birthday. What else this weekend? Four of my friends hosted an Inaugural Movie Night on Sunday, because they have a projector! Like the whole huge set-up: big screen and sound and everything. Their living room is literally like a movie theater. To start off what I anticipate will be a series of projector-supported movie nights, we watched Barfi! a Bollywood hit. I've actually never watched a Bollywood movie before, and it was hilarious! Like the style of a Charlie Chaplin film, with plot elements from The Notebook, and just a smidgen of the Borne movies thrown in there too. Completely silly, and thoroughly entertaining! There were not epic dance scenes, which I thought was a requirement of Bollywood, but the whole movie was set to music with very little talking, so it was kind of like watching a 2-hour dance scene. And with that I conclude my Weekend Report. Hopefully I'll be more regularly blogging soon! I looked out my window this morning at 15 inches of snow, heard my roommate mention that it was feels like -20 when she was supposed to leave for work at 5 am (it feels like -14 right now), and thought hmmm so what was it that made me think moving to Boston was a good idea??? I'm not going out there to take a better picture. Flashback to my brilliant* (*not brilliant) idea of running outside yesterday. There were maybe 4 inches of snow on the ground and more coming out of the sky, but my street was reasonably scraped off, and I knew that it was only going to get worse, so sure, why not run? I regretted that decision SO HARD. I know now that Somerville is significantly better at snow removal than Cambridge -- a lesson I learned by slip-sliding five miles through the snowy snowy streets of Cambridge, only to return to Somerville and see that it was far less bad here. (Still bad though.) All the while I was mentally raging against snow and Boston and New England in general. WHAT WAS I THINKING? The good news is that school was canceled today...the bad news is that we are going to make it up on Sunday, and therefore will have class six days in a row next week. Le sigh. Pre-session course. I did this to me. In other news, HAPPY NEW YEAR! I hope your 2013 ended well and your 2014 is off to a good start. If you recall, 6x6, LLC, LOTR-Emily, and I dubbed last year The Year to Be Brave. And we were SO BRAVE last year. In so many ways. The four of us spent most of this past year on completely different continents -- Hawaii, US or Asia (Me), Sweden, and South Africa -- made and started some major life decisions (jobs, schools, etc. ), and tried many many new things along the way. What’s next? Now that we have been brave and made decisions and taken chances, it’s time to have fun and excel at the things we have chosen to do. So welcome to 2014: The Year to Be Awesome. Alright enough chatting, let's do Best of the Week! 29. This dog who forgot how to dog. Insanely cool but also kinda creepy: "Best Video Of The Day? MIT's 3-D Remote 'Touching' Device." "while it's debatable whether we'll ever be able to teleport objects or people around the world at the speed of light, the inFORM system from Tangible Media Group at MIT might be the seeds of the next best thing." "40 Astonishing Photos That Won Awards In 2013." To the horror of most of my friends, I love looking over edges. And mountains. So I'm pretty sure I would love this: "New Glass Room in French Alps Offers Amazingly Scary View." It is incredibly deplorable that I have never been to Europe. On the uppermost terrace of Aiguille du Midi, Europe's highest mountain peak, sits a glass cube that looks like it's suspended in mid-air. Now the tallest attraction in Europe, the structure has five transparent sides made of three layers of glass binded together. Of course, when you step into the box the most vertigo-inducing feeling will come when you look straight down through the glass floor to the dizzying view 3,395 feet (or 1,035 meters) below. "Scientists say great novels can change brain's biology"
A great novel can produce measurable changes in the brain that linger for at least five days after reading. “The neural changes that we found associated with physical sensation and movement systems suggest that reading a novel can transport you into the body of the protagonist,” Berns said. Ok one more nerdy thing: "Finding Big Data’s Place in Conflict Analysis." The key question for me becomes: is there a role for Big Data in conflict analysis? Is it something that will empower communities to prevent violence locally, as Letouze, Meier and Vinck propose? Will it be used by the international community for real-time information to speed responses to crises? Could it be leveraged into huge datasets and used to predict outbreaks of violence, so that we can be better prepared to prevent conflict? ...the volume of data coming out of a region goes down as violence goes up; what we end up with is information that is shaped out of the conflict itself. If we rely on that data to be our predictor of conflict likelihood, we have a major logical problem – that data is endogenous to (part of) conflict. Well, alright. One more. "Happy Birthday, J.R.R. 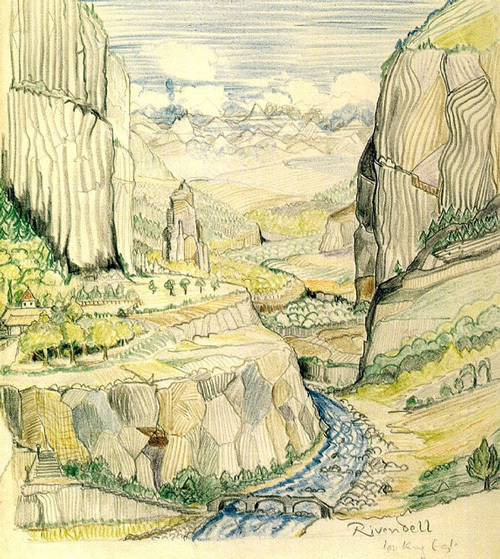 Tolkien: The Iconic Storyteller’s Little-Known, Gorgeous Art." 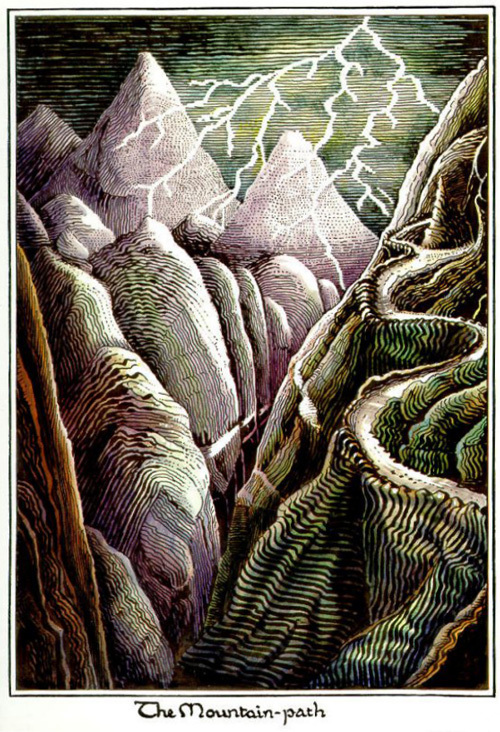 Did you know he illustrated his books? I had no idea! My copies of LOTR and The Hobbit are the old ones, so they have his illustrations! 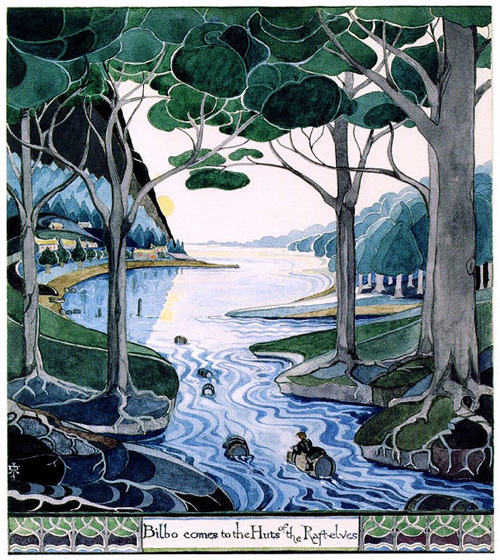 ...few realize that Tolkien, who self-illustrated many of his famous works, was as much an artist of pictures as he was of words. Kinda silly ("25 New Year’s Resolutions Every Person Should Actually Make For 2014"), but I particularly like # 24: Stop being so shallow. Next time you find yourself judging someone based on his or her appearance, imagine the person standing in front of you saying, “I’m beautiful.” You’ll start to believe it. Ha! Go Napoleon? "10 Lines From Napoleon's Love Letters That Sound Like Crazy Texts." 10. Napoleon wrote to his brother of his failing love for Josephine. "The veil is torn…It is sad when one and the same heart is torn by such conflicting feelings for one person… I need to be alone. I am tired of grandeur; all my feelings have dried up. I no longer care about my glory. At twenty-nine I have exhausted everything." This collection of "No" gifs embodies exactly how I feel about snow (when I'm not skiing). And starting school again. And the massive stack of reading (of the un-fun variety) I have planned for today. Alright that's all for now. Stay warm out there friends!